If you aren’t sure what users you have in Dragon NaturallySpeaking, you can find them listed in the Open User dialog box. If your copy of NaturallySpeaking has more than one user, the Open User dialog box shows up spontaneously when you open NaturallySpeaking so that you can identify which user you are. 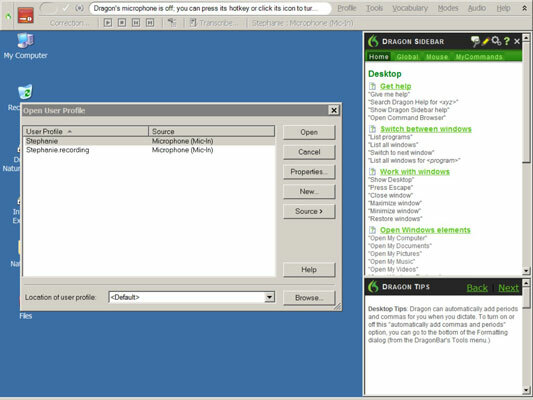 You can also ask to see it by choosing Profile→Open User Profile from the NaturallySpeaking DragonBar. When you look at the Open User dialog box, you may be surprised to realize just how many users you have. Naturally, each person who uses NaturallySpeaking is a different user, but you should also have defined separate users for different input devices (like a mobile recorder), different noise environments (like when you’re in the shower), or any other circumstance that may make you sound significantly different to NaturallySpeaking. User files take up space on your hard drive, so deleting user files that are no longer needed is good practice. Whatever your reason for wanting to delete a user, however, don’t do it rashly. All the backups for that user get deleted, too, so you can’t undo it. Choose Profile→Manage User Profiles from the menu in the NaturallySpeaking DragonBar. The Manage User Profiles dialog box appears. Select the name of the user you want to delete from the list in the dialog box. Click the Delete button in the Open User dialog box. When the confirmation box appears, click Yes.